The owners of this Norfolk barn conversion were absolutely delighted when Barn Owls moved in and nested. Choosing the best building and owl-hole position. 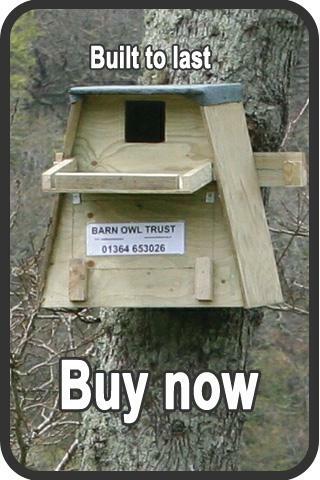 Why you should not put an owl box on the outside. Design requirements – owl hole and dimensions. Design requirements – nest space and dimensions. Design requirements – human access. Mitigation for Barn Owls already on site. You need a tall building in which a small hole can be made at least 3 metres above ground level that overlooks open ground (not screened by trees or other buildings). The ideal building will be at least 4 metres tall within which a small owl hole and nest space can be created close to the top. Where there is no residual loft space the owls’ nest space can often be incorporated within the fabric of the roof or upper-wall. 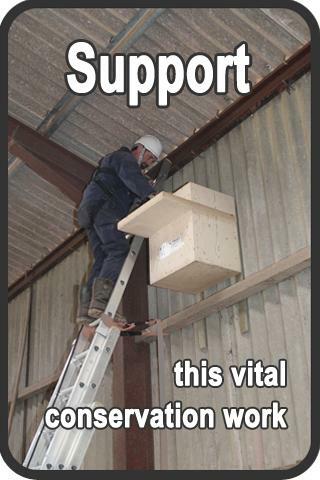 See a gallery of images showing provision for Barn Owls within building projects. Although mainly rural, urban fringe sites can also be occupied by Barn Owls. In the UK and Ireland, Barn Owls are birds of lowland countryside and are not found in high mountain, or urban/suburban areas. However, very small rural villages sometimes contain a nest site. Barn Owls should not be encouraged at sites within 1 km of a motorway or other fast unscreened main road due to the risk of road-deaths. The site in question does not need to be adjacent to a patch or strip of rough grassland as the birds are perfectly capable of ‘commuting’ across unsuitable habitats before starting to hunt and have very large home ranges. Check to see if your area is suitable. Barn Owls can become extremely tolerant of regular noise and activity around their nest or roost provided they have somewhere to hide. Once you have created a confined owl-space within your building, the birds are unlikely to be flushed out when an unexpected noise starts. Once familiar to the birds, regular or constant noises will be ignored. Thus, even rural industrial units can become nest sites. After all, Barn Owls have been nesting next to church bells for hundreds of years! If owls already roost on site, choose the tallest building that already has signs of Barn Owl occupation. Choose the tallest building that has a visible place for the owl hole to be made leading to a small space inside. The owl hole should be at least 3 metres above ground level and as visible as possible from the surrounding landscape. If the ground slopes, choose the end of the building that appears to be the tallest (provided the owl hole will be easily seen). Where there is no gable-end wall, the owl hole can be made through the roof. A good exterior box will typically last only 10-12 years whereas an indoor owl space will last as long as the building. The additional overhead shelter afforded by buildings, and even by trees, is beneficial to the owls. In cases where there is no additional overhead shelter (i.e. a box on a pole or outside wall) the nestbox needs to be a lot bigger. See the design criteria for a pole-mounted nestbox. Owl spaces should be constructed inside the building but outside of the ‘U-value envelope’. Thus, the envelope/membrane may have to be slightly diverted. Consult the book by Dr. Carol Williams (2010), Biodiversity for Low and Zero Carbon Buildings: A Technical Guide for New Build, (RIBA Publishing) for details. The second edition also deals with conversions; Kelly Gunnell, Brian Murphy and Carol Williams (2013), Designing for Biodiversity: a Technical Guide for New and Existing Buildings, (RIBA Publishing). Owl hole minimum size: 100mm wide x 200mm high, optimum size 130mm x 250mm, maximum size 200mm x 300mm. The bottom of the hole must not have any sharp edges or narrow gaps in which a toe or talon could get caught. Where necessary there can be a ‘tunnel’, minimum 150mm wide x 200mm high, between the hole and the nest space. A grippable ledge (e.g. stone or slatted timber) below the owl hole provides an exercise platform for emerging owlets. In cases where the owl hole goes directly into a nest space less than 700mm deep, an exercise platform is considered essential; the bigger the better but not less than 250mm x 500mm wide with a grippable raised edge. Floor area of nest chamber: absolute minimum 0.4m2 (e.g. 500mm x 800mm or 400mm x 1m), ideal size is 1m2 (1 metre x 1 metre). 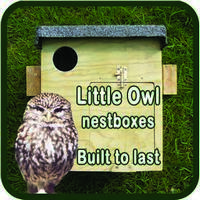 These dimensions are bigger than those for nestboxes because built-in provision usually lacks an external exercise platform that would permit maximum wing stretching prior to fledging. Where there is no external exercise platform the internal box depth from bottom of entrance hole to floor of nesting area must be not less than 700mm. Note: the ideal depth for Barn Owls is at least 1 metre which should be achieved wherever space permits. Depth from bottom of entrance hole to floor of nesting area must be not less than 450mm provided that there will definitely be an easy-to-grip external exercise platform for fledglings to stand on outside the owl hole. In a large loft simply partition off a section behind the owls’ entrance hole. See images of the construction of an owl partition in a loft. Stone, brick and timber are all suitable materials. Although owls are not destructive and seem unharmed by soft insulation materials, these are usually best avoided. In an unheated building, no insulation is required. See images of the construction of a built-in nest space in an unheated outbuilding. Lining the space is not essential although some owl workers think that a thin layer of wood flakes encourages occupation. An internal perch positioned as high or higher than the access hole may be beneficial as long as the space is big enough to accommodate one without resulting in one perched bird defecating on another underneath. From the owls’ point of view, insulation is not required. However, there should be some form of moisture insulation between the owl space and the building interior. Where space is at a premium, use a highly efficient heat insulation board (e.g. 50mm Celotex polyurethane foam). Where space allows, use a more environmentally (and thicker) heat insulation board (e.g. a wood fibre board like Pavatex) to which a sound insulation board can be added (e.g. 60mm Pavatherm) if required. Human access is essential. Here is the interior part of an owl nest-space with its insulated inspection panel removed. Human access is essential as the nest space will need to be cleared out very occasionally. A generous removable inspection hatch or door in the back of the owl space (accessible from the building interior) is usually the preferred option but in some cases an external arrangement may be a practical option. In the case of a loft partition, create an integral crawl-through doorway. The access should permit all or most of the nest space floor to be reached by hand. If you are planning to develop a site that has evidence of Barn Owl occupation (either current or within the past 2 years), you will need to mitigate the impact of the development on the resident Barn Owls. 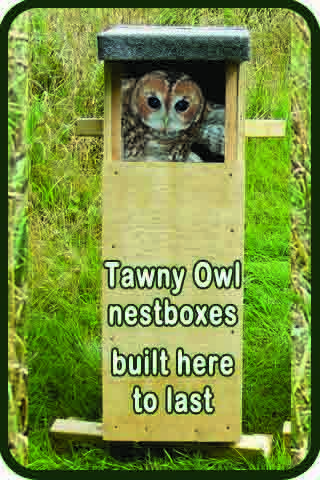 Take a look at our planning decisions page to find out more about mitigation for Barn Owls. As well as places to live, Barn Owls need food. Find out how to manage some of your land as rough grassland. Has a Barn Owl moved in yet? Have you looked beneath the owl-hole? Check out our signs of occupation page. If you see a wild Barn Owl please do report it on our Barn Owl Survey Website. 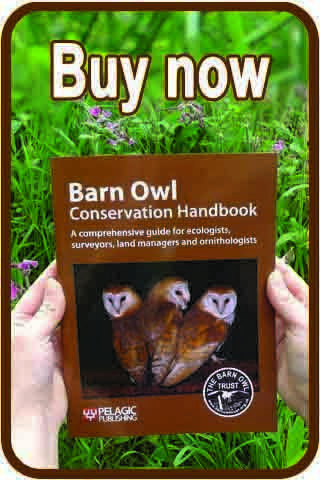 There’s more information on this topic in the Barn Owl Conservation Handbook. 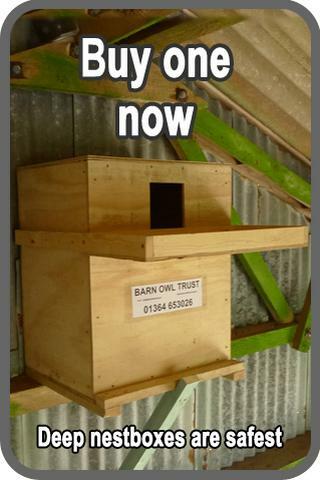 Start your own Barn Owl Project!